LOS ANGELES — There were meals members of the Mather Mountain Party wouldn’t have believed if they hadn’t eaten them. For one breakfast in the Sierra Nevada Mountains during the summer of 1915, there was “fresh fruit, cereal, steak, potatoes, hot cakes and maple syrup, sausage, eggs, hot rolls and coffee,” Horace Albright, a member of the party, wrote in his book detailing the expedition. And for one dinner, there was “soup, trout, chops, fried potatoes, string beans, fresh bread, hot apple pie, cheese and coffee,” according to the writer Robert Sterling Yard. The meals were prepared by Tie Sing, a backcountry cook working for the United States Geological Survey. In 1915, Stephen Mather, a special assistant to the secretary of the interior, hired Sing to cook for a two-week wilderness expedition intended to convince business and cultural leaders of the importance of a national park system. Sing’s work appears to have been appreciated. 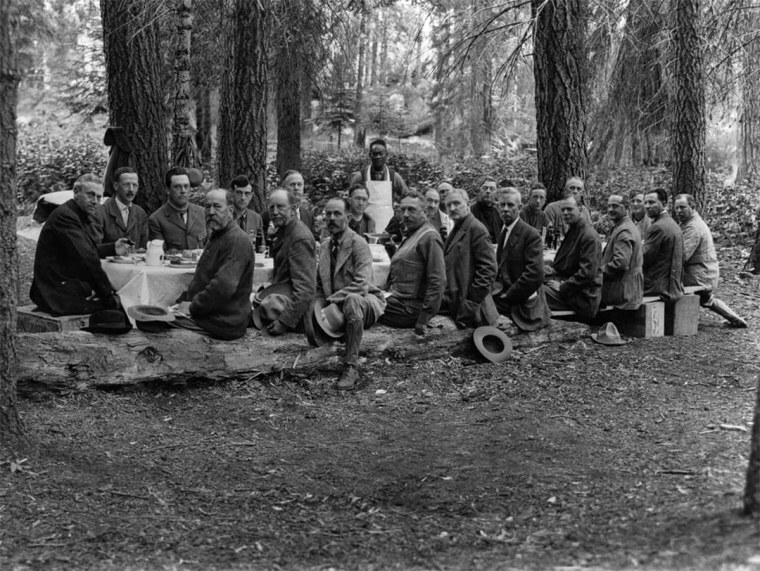 Members of the party recorded his meals in their notes — including how Sing was able to put together a “fabulous dinner” despite a supply mule carrying “delicacies” like cantaloupe and fresh lemonade wandering off — and one year after the expedition, the federal government established the National Park Service. “Because of the way he made that a memorable and enjoyable experience, that contributed a substantial part toward influential people having a very positive perception of the mountains and the need for doing something to preserve the wilderness,” Eugene Moy, past president of the Chinese Historical Society of Southern California, said. Sing, who died in 1918 in a backcountry accident, was one of many Chinese immigrants who played key roles in the history of America’s national parks that some parks staff, historians, and outdoor enthusiasts are working to celebrate. Those roles included cooks and laundry staff at park hotels, as well as workers who cleared roads for stagecoaches. People of Chinese descent began migrating to the West in 1848 to work as miners after the discovery of gold in California, according to Yenyen Chan, a Yosemite National Park ranger. Gold became increasingly scarce shortly after the California legislature in the early 1850s passed laws that imposed taxes on non-American miners and laborers. As a result of these levies, most Chinese laborers left mining and sought jobs in other areas, Chan said. A number found work in Yosemite hotels based on their culinary skills and strong work ethic. Jack Shu, who worked in California's Department of Parks and Recreation for 29 years, only learned while he was retired in 2011 that Chinese workers had a hand in clearing Yosemite's roads and worked at park hotels. He remembers feeling shocked when he found out and said he felt it was a “missed opportunity” for the park service. “We learn of how great John Muir was in establishing national parks; Teddy Roosevelt and other individuals that helped build the national parks. And that story gets repeated year after year after year,” Shu said. But while the park service had done a good job of preserving Yosemite’s Chinese history, Shu noted, it has yet to integrate it into the general understanding of the park. Learning about the Chinese-American history of Yosemite prompted Shu to brainstorm ways to raise awareness about the community’s contributions to one of America's most popular national parks, which sees more than 5 million visitors per year, according to the park service. Shu pitched the idea of an annual pilgrimage to honor the Chinese who contributed to the development of Yosemite. The six-day event, called the Yosemite-Sing Peak Pilgrimage, launched in 2013 and is scheduled to take place from July 30 to Aug. 1 this year. During the first three days, participants learn about Chinese contributions to Yosemite through walks to historic sites including the Old Yosemite Village — where many Chinese lived and worked, talks on subjects like how the Chinese Exclusion Act connected with the building of roads in Yosemite, and a potluck dinner. Chan, who has led some of the pilgrimage programs for the last five years, said one of the walks she leads takes place at a higher elevation region in the park called Tuolumne Meadows, which features Tioga Road — the highest road across the Sierra Nevada range, reaching up to 9,945 feet above sea level. There, she talks about the role Chinese immigrants played in the construction of the original road: Approximately 250 Chinese and 90 European-American laborers completed the 56-mile wagon road over 130 days in the fall of 1882 and the spring and summer of 1883. The last half of the pilgrimage culminates with a three-day backpacking trip to the top of a 10,552-foot mountain called Sing Peak on the southeastern border of the park away from its more heavily trafficked areas. Former USGS chief geographer Robert Marshall named the mountain in 1899 after Sing, who at one point served as the head chef of the USGS. Chan said she has been sharing Sing's story for more than a decade with people in park programs she facilitates, but his significance is just beginning to reach a wider public audience. In 2011, she collaborated with Yosemite's park videographer to co-produce a video highlighting the history of Chinese in the national park. It's the one Shu saw that prompted him to propose the annual pilgrimage. He said he hopes the event has an impact on the millions of visitors to Yosemite National Park. The number of people who participate in the Yosemite-Sing Peak Pilgrimage has risen each year, Chan said. She estimates that the first pilgrimage in July 2013 saw somewhere from 20 to 30 participants, while last year's event saw more than 60. For Shu, a first-generation Chinese American, learning about the contributions of Chinese immigrants to Yosemite National Park has made him proud and exposed him to a legacy he wants to support and pass on, he said. This year, he worked on a resolution introduced in the California legislature that would recognize the contributions of Chinese Americans to Yosemite National Park and the Sierra Nevada. Co-sponsored by several members of the legislature’s Asian Pacific Islander Caucus, the bill is currently in committee. “As any person who sees someone else who looks like them and has done something great, that kind of inspires us to continue,” Shu said. Shu calls the trek to Sing Peak a “spiritual gift,” one that offers beautiful scenery of rocks and mountains, trees and bushes, and a lake that the group camps by during the hike.